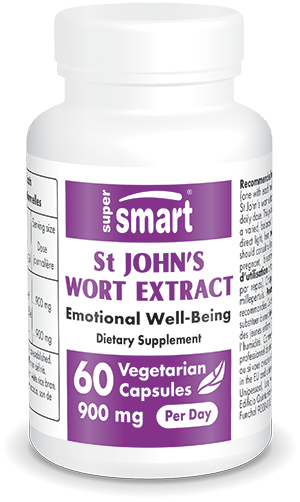 St John's Wort Extract for Depression | Multiple Benefits | Get Here! Hypericum extract to fight depression. Treats mild to moderate depression (depressive conditions, anxiety, nervous agitation). Causes fewer side-effects than synthetic antidepressants. St. John's Wort for depression: a natural effective alternative to the addictive and handicapping chemical straight-jackets. It is in Germany that were carried out the first studies showing the effectiveness of St. John's Wort for improving mood. When women aged between 55 and 65 years received St. John's Wort extract as a unique therapy, the modification of the urinary metabolisms indicated an increased cerebral production of dopamine, a normal effect of anti-depressants. And the subjective indicators of depression (anxiety, loss of interest, lethargy, anorexia, feeling of uselessness) were all significantly improved. Other studies proved that St. John's Wort is more effective for depressive symptoms than certain common medication, such as amitriptylin and imipramin. In a recent multi-analysis published by the British Journal of Medicine (1996 : 313 : 253-8), 1.757 patients suffering from light or moderate depression were separated into 23 sub-groups. The results indicated that St. John's Wort extract was at least as effective, and perhaps more effective than conventional approaches ! In 1994 the Journal of Geriatric Psychiatry and Neurology dedicated a whole issue to 17 studies documenting the value of St. John's Wort in cases of light or moderate depression. Conclusion of the Journal: St. John's Wort is a natural anti-depressant remarkably lacking in side effects. Each capsule contains 300 mg of St. John's Wort extract standardized to contain 0,3% of Hypericin. Take 3 capsules per day (1 with each meal): This dosage is the one used in the studies mentioned below. To obtain the best results, you must take St. John's Wort for at least 4 to 6 weeks.